The parents of Mark Hughes and Roberto Mancini had to be called to Eastlands this afternoon after the warring managers were involved in an unsavoury spat after the final whistle of the 1-1 draw between Manchester City and Fulham. After an ill-tempered handshake between the two bosses, words were exchanged in the tunnel on the way back to the dressing room. 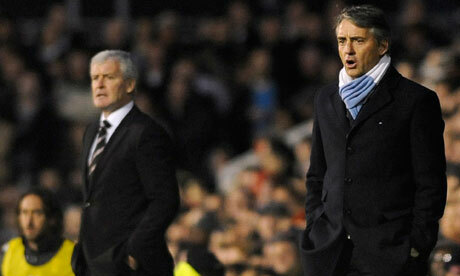 It is thought that Hughes called Mancini “a scarf-wearing pretty boy with girl hair” before Mancini slapped him around the ear and kicked him in the shin. Stewards managed to split them up before briefly before Hughes broke through them and thrust his knee into the groin of Mancini, before bending the Italian’s fingers back until he screamed. Mancini did manage to stop this onslaught by stamping on the toes of Hughes before throttling the Welshman with his trademark pale blue and white scarf. He then pulled out a handful of his hair and hit him with a “tango slap” – two cupped hands clapped together over Hughes’ ears. It is often thought that this can cause victims to go deaf, but Hughes seems to be showing no ill effects. With the Fulham boss on the floor, it is thought that Mancini started on his way back to his dressing room when he was confronted by Fulham assistant manager Mark Bowen. As he distracted Mancini, Hughes crawled behind the Italian on all fours and when he was in place, Bowen pushed him over. With Mancini on the floor, Bowen held him down by kneeling on his shoulders and Hughes gave him an extra-hard Chinese burn. Unofficial reports coming out of the City of Manchester Stadium state that Hughes even spat on his hands first to make sure that the Chinese burn was extra intense. Both sets of parents are said to be “very disappointed” in the behaviour of their sons, with Mancini’s mother Irene stating that although her son came off worse, he is “just as bad as the other one”.